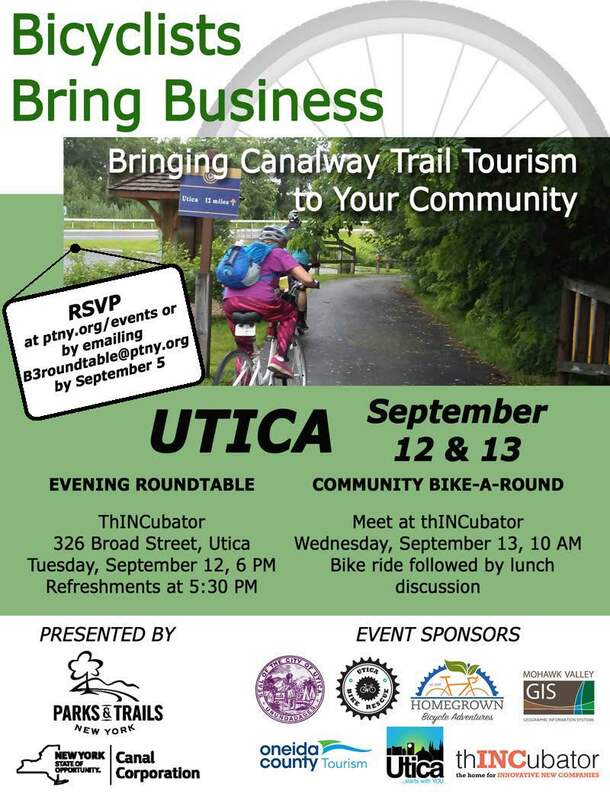 Parks & Trails New York and the New York State Canal Corporation hit the trail to Utica for the annual “Bicyclists Bring Business: Canalway Trail Tourism for Your Downtown!” events. The evening program and community bike ride generated healthy discussion and excitement about how Utica, Oneida County, and the Mohawk Valley can further develop as cycling destinations. This year’s events were sponsored by the City of Utica, Oneida County Tourism, Oneida County Health Department, and Utica Bike Rescue, Homegrown Bicycle Adventures, and Mohawk Valley GIS. The venue for Tuesday’s Evening Roundtable was thINCubator (326 Broad Street, Utica), a shared work space that demonstrates that innovation and creativity are alive and well. After light refreshments, the evening’s presentations provided an update Utica’s growing urban cycling network and future connections to the Empire State Trail, and some background on bicycle tourism on the Erie Canalway Trail. The heart of the program, as always, was robust discussion and a bringing together of various public agencies and resident groups around issues related to the bike/ped network. All Attendees received a copy of the handbook, Bicyclists Bring Business: A Guide to Attracting Bicyclists to New York’s Canal Communities. On Wednesday, as a follow-up to the presentation, staff from Utica Bike Rescue led a Community Bike-a-Round, a relaxed ride on Utica’s stretch of the Erie Canalway Trail and through several of Utica’s vibrant downtown neighborhoods. Along the way, the group was able to see new recreational loop routes from the perspective of a cycling tourist. We’ll make stops to discuss connection to local points of interest and opportunities for improved infrastructure, programming, and promotion. After the ride, the group talked over what they saw over lunch at Aqua Vino. wonderful ride that reinforced Utica’s beauty, history, and great potential as a cycling destination, much work remains. However, all agreed that the enthusiasm generated and connections made at this week’s events will provide a boost to local efforts. Coverage of the evening event is available here, and bike around clips here. According to a 2014 study, the Erie Canalway Trail experiences more than 1.58 million visits per year, and spending by ECT visitors generates approximately $253 million in annual economic impact. Oneida County’s 25 miles of existing Canalway Trail feature scenic views of the Mohawk River and connect the cities of Rome and Utica to the statewide trail network. With the County’s remaining gap section scheduled to be closed by 2020 as part of Governor Cuomo’s Empire State Trail vision, and the region’s unique combination of big-city amenities and access to the Mohawk Valley and Southern Adirondacks, Utica is well positioned to become a premier destination for cycling tourists and other recreationalists. Bicyclists Bring Business, or B3, is presented in one Canalway Trail community each year by Parks & Trails New York and the NYS Canal Corporation. Communities interested in hosting B3 should email b3roundtable@ptny.org. Thanks to all the great event sponsors and partners in Utica that made this year’s event memorable and successful!